A gallery of dramatic and inspirational landscapes, mostly from Ireland and the UK, with one or two from further afield. 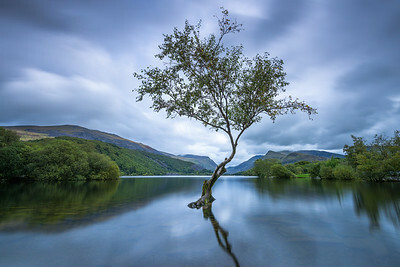 This is the famous and much-photographed Lone Tree in Llyn Padarn in Snowdonia National Park, one of the largest natural lakes in Wales. Even though it can be a busy spot and it's very close to the car-park I managed to get 15 minutes to myself on this moody Autumn afternoon. A pair of wellies enabled me to shuffle out a few feet into the lake to get a clean foreground. 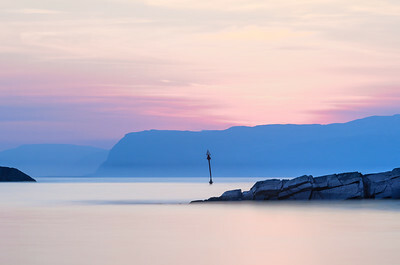 A beautiful calm April sunset view across the sea from the stony beach at the village of Ellenabeich in the West of Scotland. In the middle distance is the small island of Insh and behind that the Isle of Mull. As well as being beautifully scenic with abundant wildlife the area is also very interesting; nearby Easdale Island is a former slate-mining village, the locals still ferry shopping from the pier to their houses in wheelbarrows, the landscape is littered with glittering "Fool's Gold" or iron pyrites and it's the venue for the World Stone Skimming Championships! 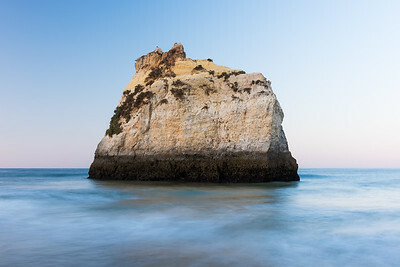 An early morning sunrise view of one of the impressive sea stacks sitting just off the beautiful beach of Prainha in Alvor in the Algarve, Portugal. The photograph was taken around 6am and the normally crowded beaches were empty save for a few local fishermen. A great cure for a hangover but beware of early morning sand-flies... got a good few bites without noticing whilst concentrating on the camera which would later become very painful! 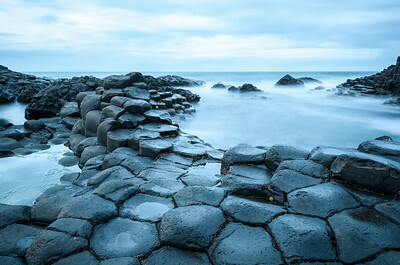 A 30 second long exposure shot of the sea and amazing hexagonal rocks at the Giant's Causeway in County Antrim, Northern Ireland. This photograph was taken at around 2pm on a September afternoon which shows that even though there is now a huge visitor centre with car park and visitor numbers approach one million a year, it's still possible to get atmospheric photos of this incredible coastal landscape. 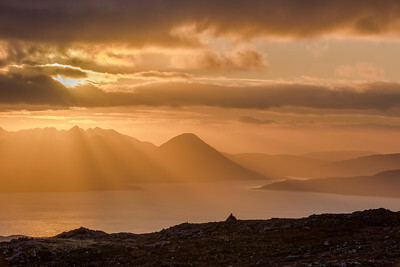 Rays of golden sunset light define the peaks of the Black Cuillin mountains on the Isle of Skye. This view is from the Bealach na Ba viewpoint which at 625 metres (2053 feet) above sea-level is the summit point on the Applecross mountain pass road in Wester Ross, North West Scotland. The single-track road with its hairpin bends is probably the most spectacular mountain road in the UK. I spent a couple of hours waiting for the light during freezing November temperatures but the sunset was one of the most beautiful I've seen.